Cookstown in the heart of mid-Ulster is known for its nightlife. Buses bring young people in from outlying towns and villages. 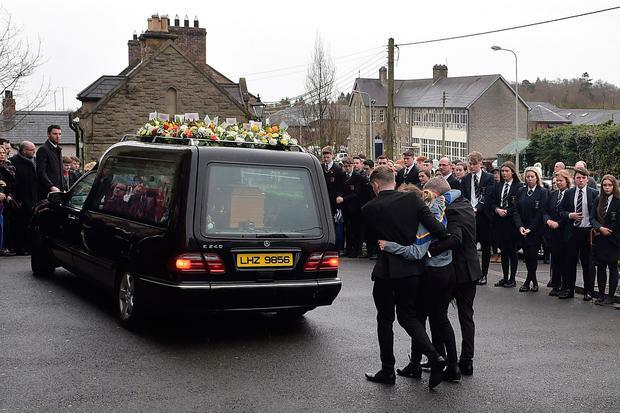 Eboney Johnson (16) was among an estimated 400 who queued in the car park of the Greenvale Hotel waiting for the doors to open for the St Patrick's Day disco. Eboney described herself as a regular at the Greenvale and was there at Christmas. "They would have had us in a line, and they would have queued us all up so there would have been less pushing and if somebody was pushing, they would have taken them out," she told reporters last week. "It never seemed to be that way on Sunday." When the pushing started, it "just kept going and going", she said. "People just started to fall. But as one person fell… another person seemed to have gone down. If a person went to pick another person up, the pushing and shoving would go [on], and another person would fall, which caused the build-up of everybody lying there." Another teenager told the Ulster Herald: "Then everyone just started swaying back and forth and pushing from side to side. Suddenly there was a rush forward and the whole queue collapsed and everyone fell to the ground." Kyra Coyle, a 17-year-old from Stewartstown, told reporters that she managed to push her way out of the crush. "I looked and at one stage there was 10 people, maybe more, on top of each other with one girl screaming to them to get off their friend. It just got worse with people at the back of the line just pushing to the front. It was awful." "Two of my friends fell to the ground. I tried to pull them up but at that stage there was no room for them to even come back up. So, I started screaming at the top of my lungs. 'My friends are on the ground, move back! My friends have fainted, move back! My friends can't breathe, move back!'" "I could still see people laughing with no idea of what was going on. At this point, I thought my friends were going to die. I was standing up and I couldn't breathe so I couldn't imagine how they felt. I was hysterically screaming for people to move but it was only the people around me who knew the seriousness. "With more and more pushing, I also fell. But the thing about me was that I wasn't on the ground, I was on top of someone, and this person was on top of someone else. As I looked down I could see multiple bodies underneath me and as I looked up I could see multiple bodies on top of me. It was the most traumatic, frightening and stressful moment of my life. "I was looking about for my friends, trying to keep my head up. As dramatic as it sounds, I closed my eyes for a little and accepted what was going to happen; however, an elbow to the throat soon woke me up. People were scratching, biting and grabbing anything they could to pull themselves up to breathe." She added: "It felt like this went on forever but eventually I felt bodies being dragged over me and beside me. It wasn't the bouncers and it wasn't the police. It was the young people in the line who pulled me out. "My leg was caught underneath someone and my hair was caught somewhere else. My jeans were pulled down around my thighs and my jersey above my head but I was getting pulled out nonetheless. I lay on the ground and I opened my eyes, I remembered seeing some motionless legs, a few socks and shoes and then I was pulled up and brought away." Eboney Johnson described how the crowd was eventually pushed back by others who "formed a bit of a circle nearly. None of us could properly see but we were being pushed and shoved until this circle was formed. And we looked down and we could just see everybody lying there. And then next we could just see Connor himself being taken out. And then, they got everybody away, and everybody started walking because we never really knew the seriousness of what actually happened."